My Lab destroyed “dog beds” at the same rate as Charli. I think it’s the stuffing. We gave him an old, firm couch cushion 7 years ago. So far, not even a scratch! Mine too- foam, not stuffing. That’s the ticket! Crib mattress? Or maybe try one of the new beds made by KONG. Cushions made for lawn furniture may be another less expensive alternative, too. Charli is not alone. After numerous destroyed beds, cushions etc we’ve given up. We now just chuck old woollies on the floor and the dogs make their own beds. And yes, they get walked 2-3 times every day, too. Kuranda beds are indestructible and super comfy. You will never buy another bed. My boys (4 black Lab mixes) destroyed beds (and everything else), but slowed down on the destruction when they reached 2 years old. I think me starting to sleep on a day bed in the room with them helped. They never misbehave if I’m around. We have a boxer and learned they are nesters. 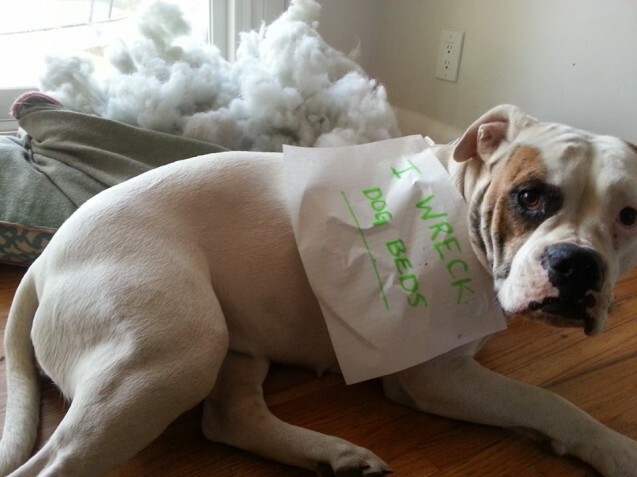 They tear up beds to make a ‘nest’ in their kennel or other space. We got her a bunch of soft blankets and they have lasted for at least 2-3 years now, she can move them around her kennel how she likes. We buy blankets from Goodwill for our crazy, bed-tearing boxers. You just have to make sure not to buy those quilted comforters with the batting inside..
My dog did the same until I moved his bed into my bedroom, hasn’t destroyed a bed since. I think it was separation anxiety. Be careful with the foam! My dog had to have his bum “excavated” at the vet when he decided to eat his foam bed. Whenever he decides he wants to eat something he shouldn’t, my dad asks him if he’s ready for another excavation 🙂 Some dogs just love to eat things they shouldn’t. I’ve got one of those too! And seeing as he’s had a go at the foam in the sofa I don’t think that will work either! Maybe she’s just trying to adjust it to her own comfort needs. Second vote for Kuranda beds!